Tuesday, Sept. 29 at 7 p.m. This documentary film tells the story of the legendary “Aztec Eagle” pilots of Fighter Squadron 201, the only Mexican military unit ever to serve outside of that country. 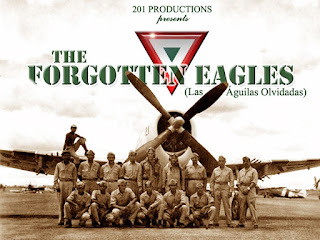 Created by special accord between Presidents Franklin Roosevelt and Manuel Avila Camacho, the elite unit of bilingual aviators and ground personnel helped American forces liberate the Philippines during World War II. The pilots’ exploits were highly publicized; they became national heroes in Mexico and symbols of bi-national solidarity. Their unit was decorated by the governments of all three countries for valor in the cause of freedom and its members honored by the president of each nation. The documentary was filmed over a three-year period in Mexico, the Republic of the Philippines and the United States. It blends rare archival footage of the unit in training and in the Far East with present-day interviews with squadron veterans, their families and historians in the three countries. Among its memorable segments is one that features the late Captain Reynaldo Perez Gallardo, a fighter pilot who flew with the unit in the war, viewing the remnants of the squadron’s old airfield in the Philippines after 60 years. The film has several Northwest connections: two individuals interviewed in the film – Philippine Army veteran Alejandro De la Rosa and American pilot Lt. Colonel Howard Tuman who helped train the Mexican pilots – resided in Oregon. The film’s technical advisor/researcher, Sig Unander, is a Portland area writer. The National Combat History Archives in Hillsboro donated rare historical film footage and the Tillamook Naval Air Station Museum provided the use of a rare P-47 Thunderbolt fighter aircraft. The film’s producer/director Victor Mancilla, a native of Mexico City, owner of Eravision Productions of Los Angeles, previously produced or directed documentaries with Hollywood stars including Kelly Hu, Anthony Hopkins and acclaimed actor Edward James Olmos, who introduces and narrates part of The Forgotten Eagles. “This is a positive story of Mexico partnering with the United States and the Allies to help liberate the Philippines, a former sister colony to Mexico. It is also a dramatic personal narrative, told firsthand by those who lived it,” he said.